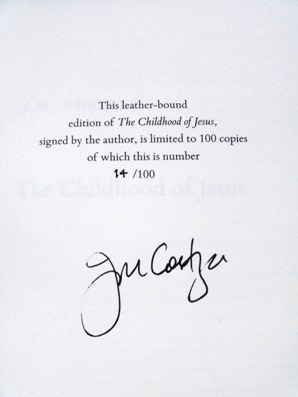 Limited LEATHERBOUND first edition signed and numbered by the author. Synopsis : After crossing oceans, a man and a boy arrive in a new land. Here they are each assigned a name and an age, and held in a camp in the desert while they learn Spanish, the language of their new country. As Simon and David they make their way to the relocation centre in the city of Novilla, where officialdom treats them politely but not necessarily helpfully. Simon finds a job in a grain wharf. The work is unfamiliar and backbreaking, but he soon warms to his stevedore comrades, who during breaks conduct philosophical dialogues on the dignity of labour, and generally take him to their hearts. Now he must set about his task of locating the boy's mother. Though like everyone else who arrives in this new country he seems to be washed clean of all traces of memory, he is convinced he will know her when he sees her. And indeed, while walking with the boy in the countryside Simon catches sight of a woman he is certain is the mother, and persuades her to assume the role. David's new mother comes to realise that he is an exceptional child, a bright, dreamy boy with highly unusual ideas about the world. But the school authorities detect a rebellious streak in him and insist he be sent to a special school far away. His mother refuses to yield him up, and it is Simon who must drive the car as the trio flees across the mountains. 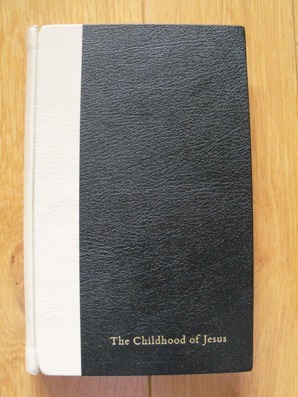 The Childhood of Jesus" is a profound, beautiful and continually surprising novel from a very great writer.